The Board of Thor Mining Plc (“Thor”) (AIM, ASX: THR) is pleased to announce that drilling at the Bonya tungsten deposits adjacent Molyhil, in the Northern Territory of Australia, is to commence following advice from the Aboriginal Areas Protection Authority (AAPA) providing clearance for the planned drilling program. 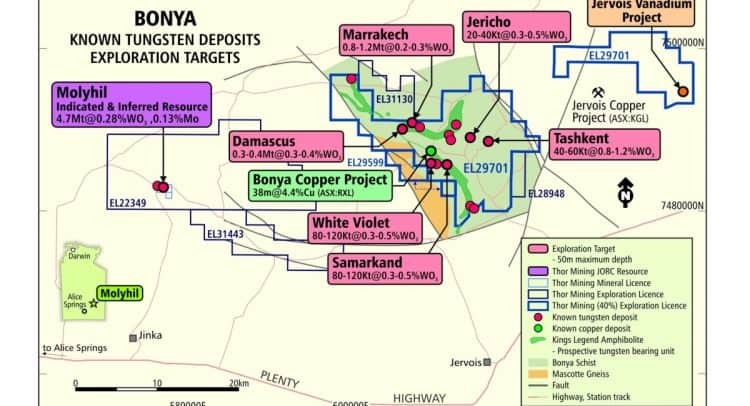 · Drilling now expected to commence early April, with further updates expected on drilling progress, preliminary on-site XRF analysis, followed by formal laboratory assays. The Northern Territory Aboriginal Areas Protection Authority (AAPA) has now issued the Authority Certificate clearing the way for exploration activities on the Bonya Project Exploration Licence EL29701. Pending re-establishment of access following substantial rain brought about by ex-Tropical Cyclone Trevor, planned exploration activities includes the drilling and additional trench sampling programs to advance the first five of 13 outcropping tungsten deposits at Samarkand, White Violet, Jericho, Tashkent, and Marrakesh. The program will comprise in the order of 2,500 metres of drilling by Reverse Circulation (RC) method in addition to 200 metres of trench sampling across the outcropping deposits. It is anticipated that the program will be completed within two weeks of commencement with provisional XRF results to follow and assay results after a further four weeks.